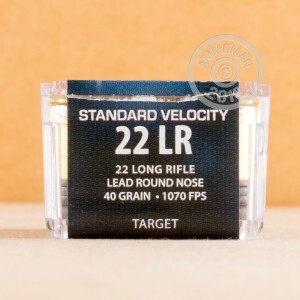 Grab this 500-round brick of .22 LR ammunition to put a smile on the face of your shooter friend or family member. 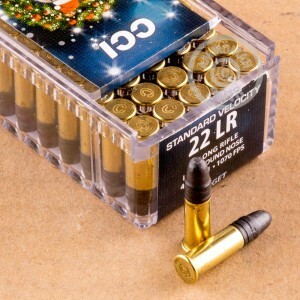 This ammo is made by CCI and features festive packaging for Christmas 2016. Each round in this case fires a 40 grain lead round nose bullet at a subsonic muzzle velocity of 1,070 feet per second. Expect solid accuracy and reliable ignition--a familiar advantage of CCI ammo. These cartridges are loaded in Lewiston, Idaho. CCI is a division of Vista Outdoor, which also includes Federal, Speer, and many other respected shooting brands. Don't forget, at AmmoMan.com all orders over $99 will ship for FREE! It's going to work perfect as soon as the snow is gone so we can shoot again. Ordered during Christmas and it came pretty quickly. Maybe had a bad brick, new brick seems to run fine. Still a bit dirty. Stay away from this junk. Dirty and at least 1 FTF per mag. Shooting a 22/45 and a 10/22 same problem consistently.